Ninox is safe. And your data is too. Are you worried about the new basic data protection regulation? Wondering if you can still use web-based apps like Ninox? We have legal contracts with all hosting and technical partners for DS-GVO-compliant order data processing (ADV). And, of course, as your contract processor, we confirm compliance with the DS-GVO with an ADV contract. Request your personal copy today. 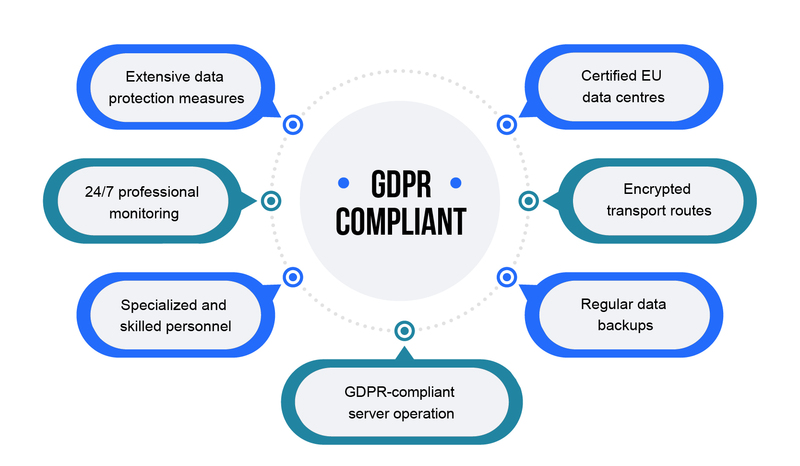 At Ninox, data protection begins with the design and implementation of technical processes with regard to data protection, data security and economical use of data. Each member of your Ninox Cloud team needs only a valid e-mail address to register. No additional information is required. Furthermore, Ninox also assists you in the DS-GVO-compliant handling of personally-identifiable information in your area of responsibility. Control data access using roles and rights. Monitor all changes to the data using the historical data log. Back up your Ninox databases locally with a click of the mouse. Find all the required data of the person concerned with the global search. Make changes based on the logging. If required, delete the concerned data with two mouse clicks. As you can see: When you choose Ninox, you are acting in full compliance with DS-GVO regulations and benefiting from all the advantages of collaborative, location- and platform-independent work. Here you can test Ninox free of charge for 30 days. Here you can test Ninox free of charge for 30 days. Do you have any unresolved questions? Do you need more information? Just talk to us. We will be pleased to answer your queries at any time.